Charles R. Stivers sent in this wedding photo from an album he purchased on EBay. The picture was taken in Anamosa. He believes it is George H. Stivers and Matilda Harrison, or possibly William Wallace Stivers and Marie Louise Vanderslusis, who lived in Anamosa before moving Minnesota. Can you help him identify this photo? These Jones County Marriage Books were generously transcribed for the Jones County page by Joyce Wells and JoAnn Walters. Data entry by Joanne Wilken and HTML conversion by Richard Harrison and Ann-Marie Lindstrom. Listings have been rearranged alphabetically by groom's surname and by bride's surname. Spelling and other errors are as in the originals. Known errors are footnoted and you are encouraged to submit additional corrections to Richard Harrison. Marriages were not always immediately recorded in those days. There will be some overlap, date-wise, between marriage books. 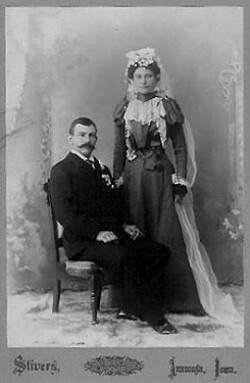 After 1880, the law required parents' names on marriage licenses. Marriages before then do not have parents names. 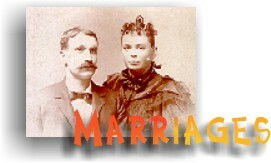 The Jones County Genealogical Society has the marriages on microfilm at the library. We will be happy to provide the above information to interested parties. Write to Joanne Wilken. 19th CENTURY DIVORCE Death wasn't the only reason our ancestors parted. Along with marriage comes divorce—and it was more common in the 19th century than many people think. What do you read between the lines?